Port Wine Stain (PWS), also called Nevus Flammeus, is a congenital, cutaneous vascular malformation involving post-capillary venules which produce a light pink to red to dark-red- violet discoloration of the human skin. PWS occurs in an estimated 3 children per 1,000 live births, affecting males and females and all racial groups equally. There appears to be no hereditary predilection for PWS within families. There are no known risk factors or ways to prevent PWS. The cause and origin of PWS remains incompletely uncovered. It is believed that PWS develop within the first 2-8 weeks of gestation. PWS is a progressive vascular malformation of the skin that remains throughout life and there is no involution. PWS are well demarcated and flat and grow proportionately in surface area with the child. 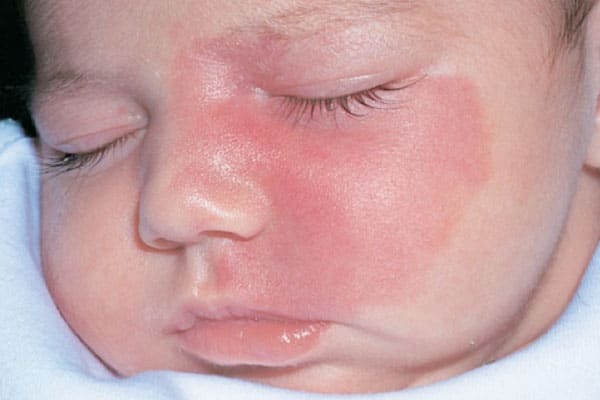 In infants and young children, PWS are flat red macules. However, the lesions tend to darken progressively to purple and, by adult age, often become raised as a result of the development of vascular papules or nodules. These changes in color and contour are attributed to progressive ectasia of the abnormal dermal vascular plexus. Over time, blood vessels become more dilated and susceptible to spontaneous bleeding or hemorrhage following minor trauma. Bleeding can be difficult to control, necessitate hospitalization and may also increase the likelihood of skin infection. If left untreated, PWS often become incompatible with normal life due to the development of vascular nodules on the skin surface which can often bleed spontaneously with incidental trauma.